A few years ago, we had a change problem. Pennies and dimes would congregate on counters while quarters and nickels took up residency on the mantel. The first solution came when my brother Connor gave us a ceramic piggy bank for Christmas. All the change goes in the pig. Done. 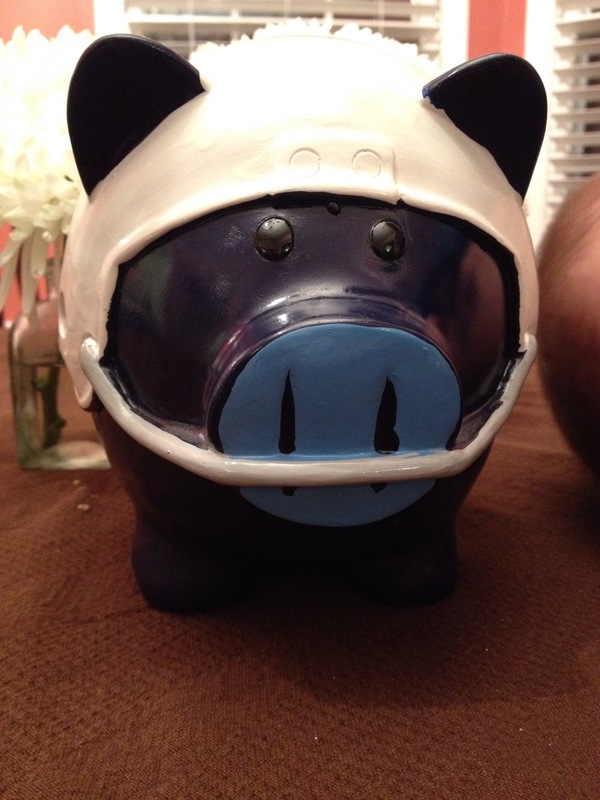 Except, I like to be saving for something, so the coins in the pig became earmarked as the date fund. When we got enough change, we would use it to buy tickets to a baseball game and spend the spare on BBQ nachos. Then, as tends to happen, I got to thinking. What if we used the pig for something bigger than a day at the ballpark? What if we could make our change matter to someone else? We rechristened the ceramic swine the donation pig and set out to start a new advent tradition. During our season of waiting, we count the money and use it to buy something for one of the many organizations in town that are close to our hearts. The idea is that as our child grows, he can help us save pennies, count quarters and decide who we can help. Greg and I want to make helping others a visible part of our family’s life, and we hope that using our spare change to do something to help somebody else as a family will drive that point home. Last week we counted and rolled our pig’s treasure and came up with $28.49. We made a family trip to the store and bought three teddy bears, which the baby and I took to the Memphis Child Advocacy Center. The Memphis CAC’s mission is to help victims become children again by working with children who have been sexually and physically abused. Every child who is helped at the CAC gets to pick out a friend from the teddy bear wall in the lobby to go through all their interviews, counseling and court appearances with them. Three teddy bears is a drop in a very large bucket of need, but it is something.